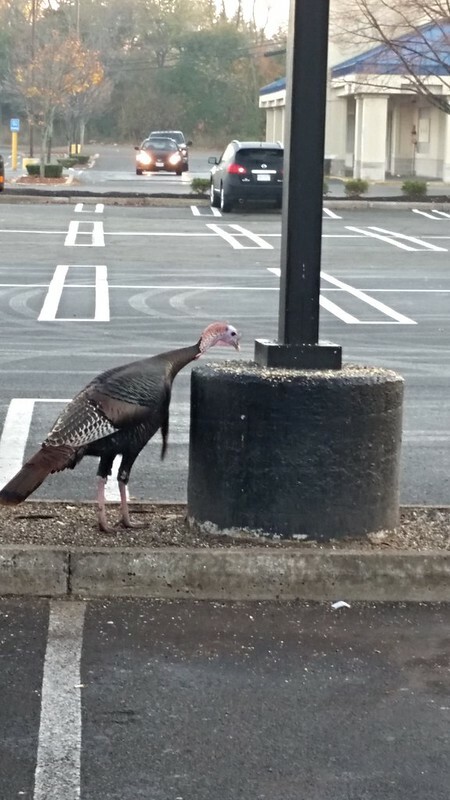 A large turkey picking at rocks on a light post in a parking lot in the early morning. I was coming out of Panera with my breakfast in tow and I see a man standing in the middle of the road taking a picture. For a second, I thought he was taking a picture of the van in front of him and it had me wondering if this was accident related. But then I looked to the right of the van and there was this rather large turkey and I instantly got it. He finished taking photos and I went to my car to put down my food and come back to snap a photo. Here's the interesting thing thought. I'm not sure I would have noticed the turkey if it wasn't for this guy. Because the parking lot is pretty large and I was in Panera for only a few minutes, so in all likelihood, the turkey was there when I initially parked, but I never saw it. Maybe it was because I hadn't had my morning coffee yet or I was so focused in getting breakfast and getting to work, but I missed the turkey entirely. Clearly, no matter how much I hope this project has helped me to keep my eyes open, I'm still pretty tunnel visioned at times.